Company Microdor was established in year 2000. Its main activity is software development. We develop our products with much care and professionalism so as to best meet the needs of our customers. We believe that this way we will be most useful to our customers, society and people in the company. One of our ambitions is that all students have access to specialized software. 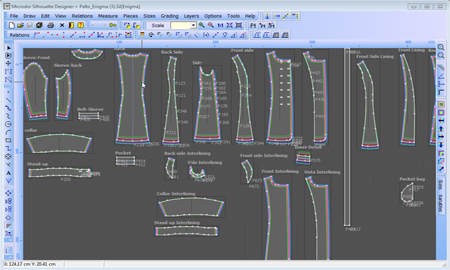 Microdor team consists of trained professionals with years of experience in design and maintenance of CAD / CAM systems, modeling and design of garments. We are active, reliable and work alongside our clients in implementation and maintenance of our products. Our business is growing along with that of our customers. We work with reliable partners, whose quality we are confident through years of experience. GammaTech GammaTech is a Chinese manufacturer of plotters and digitizers for the apparel industry. The company has quality certificate ISO 9001:2000. For the series plotters Jetlink it is certified CE. Initially the company started its activity with the production of plotters under license Algoteks as at a later stage began producing self-plotter named JetLink. GCC is known for its uncompromising and unsurpassed quality. Each system undergoes strict quality control with state-of-the-art measuring and testing techniques. Over the years, GCC has established itself as the industry pioneer in supplying the most complete line of quality cutting plotters, laser engravers and thermal transfer printers. The National Outstanding Award (2003), the Rising Star Award (2002), the Symbol of Excellence Award that we receive each year since 1997, and the recognition in each industrial leading magazine signify the well-known reputation of GCC.